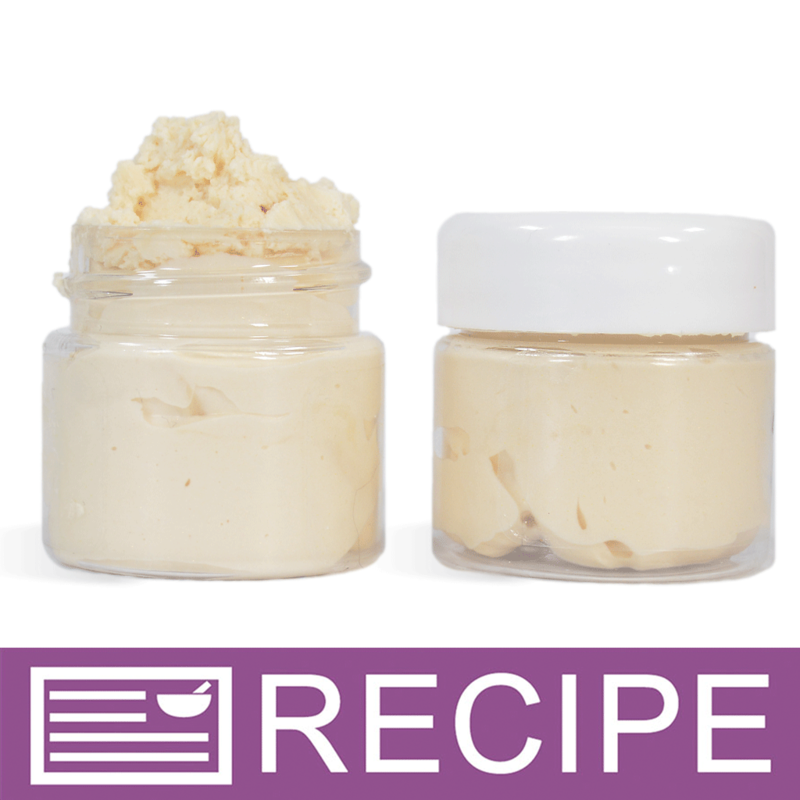 This sweet smelling whipped butter will get your lips "pucker" ready. The butters and oils help dry lips feel hydrated and soft. It quickly soaks into the skin without any greasy after-feel. To metal pan or double boiler, add Macadamia and Kokum butters. Heat butters on low until they have completely melted. Remove from heat once melted. Add Shea Butter and Castor Oil and blend into melted butters. Pour mixture into mixing bowl. Place bowl into refrigerator just until product starts to thicken and solidify. Using a hand mixer on low, start to whip the butters until they start to thicken. Be sure to scrape bowl often while mixing. Add Tupelo Honey Flavor oil, Vitamin E, Aloe Vera Powder and 4 scant micro scoops of dark gold mica powder. Continue whipping until the butters are thick and fluffy. Remember to scrape often to incorporate all the product on the sides of bowl. Using a pastry or zip close bag with the corner cut off, pipe mixture into jars, filling to 0.45 oz. each. You can also use a small spoon or spatula to fill jars. Apply lids and label product accordingly. To Use: Apply to dry lips as needed. Ingredient Label: Macadamia Butter, Shea Butter, Kokum Butter, Castor Oil, Flavor Oil, Aloe Vera Powder, Vitamin E, Fluorphlogopite, Titanium Dioxide, Iron Oxide. "I would like to make a different flavor lip butter is that possible also would like to make a lip scrub. Is it possible to do like a peach body butter or strawberry? Lip butter and scrub set?" Staff Answer You can certainly use a different flavor oil in this recipe. Any of the products you have mentioned are possible. We recommend looking at all our recipes to get ideas and then substitute the flavors, fragrances, butters, etc. that you want to use. "Does this contain actual "honey" as I am deathly allergic to all-things bees? I cannot touch or smell honey, beeswax, and obviously a bee sting"
Staff Answer The "honey" is from the Tupelo Honey Flavor Oil used in the recipe. We do not believe this contains any honey but we cannot be sure since the ingredients are proprietary. If you are extremely allergic, we would recommend not using. "Can you please tell me what function the aloe Vera-100x powder serves in this recipe? Thank you. Rose"
Staff Answer The aloe vera powder adds moisturizing properties to the lip butter. You could substitute honey powder if you wish.